Just when you thought you’ve seen it all in drug abuse among teens, here comes a new drug reportedly more potent than heroin and more dangerous than crack: bath salts. "Bath salts" (mephedrone and methylenedioxypyrovalerone) or MDPV has been responsible for sending scores of teenagers to the emergency rooms across the country. The number of emergency related incident calls related to this widely available drug skyrocketed from 235 calls last year to 246 calls in January of this year alone. The “bath salts” being sold contain cathinone, which is a plant grown in Africa. It affects the neurotransmitters in the brain much like meth or crack would. However, there is no government regulation at this time because of the fact that it is not manufactured for human consumption. Louisiana currently is being hardest hit with deaths and serious injuries because of ingested bath salts. 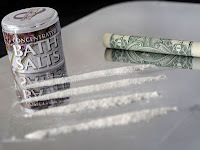 “Bath salts” has been sold under the street names of Cloud 9, Ivory Wave, Ocean, Charge Plus, White Lightning, Scarface, Hurricane Charlie, Red Dove and White Dove. It comes in powder and tablet form and is ingested by snorting, injection, smoking, or less often, by use of an atomizer. “Bath salts” is a psychoactive drug with stimulant properties, which acts as a norepinephrine-dopamine reuptake inhibitor (NDRI). Also called synthetic cocaine, fake coke, “charge” or the new Miaow Miaow, the usage of this product has become a fast-growing, highly addictive trend. Teens who have used and survived to tell the story say they can’t get enough of the fake coke. Unlike cocaine or meth, the white powder is still legal in most of the U.S. and it is sold at gas stations and specialty shops around the country. Some parents are reporting that their teenagers are staying awake for as long as 72 hours in complete pandemonium. “Bath salts” is a powerful synthetic stimulant that has been responsible for many deaths. Many users are overdosing, committing violent drug-induced suicide, or having accidents caused by their paranoia. Producing effects worst than cocaine and meth, “bath salt products” have already been banned in Scotland following related deaths. Last December the DEA listed “bath salts” as a drug of concern but has no current plans to ban it nationwide. Florida has become the second state to ban "bath salts" following Louisiana. Officials in Mississippi, Kentucky and other states have begun to take similar steps. Sold with items like herbal incense and synthetic marijuana, local drug advocates say they've seen abuse of bath salts increase dramatically. While it's a fairly new problem in Florida, deaths have already been reported in Kansas, Louisiana, and overseas. Now, the legal high is becoming more popular in the Miami / Fort Lauderdale area. According to Dr. Richard J. Geller of the California Poison Control System, the problem is what's inside these so-called salts. The most common ingredient used in “bath salts” is called 4-Methylenedioxypyrovalerone, also known as MDPV. But also commonly found inside that "instant spa at home" is Mephedrone, aka 4-Methylmethcathinone, a compound very similar in structure to Methamphetamine. Other substances Geller says are "implicated" as “bath salts” include 4-Methylenedioxymethcathinone (Methylone), 4-Methoxymethcathinone, 4-Fluoromethcathinone, and 3-Fluoromethcathinone. All four are derivatives of Methcathinone, also known as Khat, Jeff, and Cat …a drug Geller says is structurally and pharmaceutically similar to methamphetamine. The Drug Enforcement Agency (DEA) has it listed as a "schedule one" drug under the Controlled Substances Act -- the same class as heroin, pot, and mescaline. Adolescents who abuse household products (e.g., prescription pills or bath salts) may benefit from tough love. Parents may consider limiting their child's access to certain areas of the house until they can be trusted. If your teen has gotten involved with this highly addictive substance or any other drug, please seek help before it’s too late. For immediate attention, seek your nearest emergency room -- and when your teen is stabilized, seek the help of an addiction treatment center that specializes in treating teens. Anger is a normal, healthy emotion. As your step-child's parent, however, you are an influential adult in his or her life. As such, you have an immense opportunity and responsibility to help your angry step-child learn to cope with anger and express those feelings in ways that are positive and healthy. • Anger and aggression do not have to be dirty words. In looking at aggressive behavior in step-children, we must be careful to distinguish between behavior that indicates emotional problems and behavior that is normal. • In dealing with angry step-children, the step-parent’s actions should be motivated by the need to protect and to reach, not by a desire to punish. Step-parents should show the child that they accept his or her feelings, while suggesting other ways to express the feelings. Also, ways must be found to communicate what we expect of them. Contrary to popular opinion, discipline is not the most effective way to communicate to step-children what we expect of them. • We should distinguish between anger and aggression. Anger is a temporary emotional state caused by frustration, whereas aggression is often an attempt to hurt a person or to destroy property. 1. Anger is good for identifying problems – but not good for solving them. One of the problems people face is the guilt they feel after they’ve gotten angry. This further complicates the situation. We are emotional beings and emotions are helpful for giving us cues about our environment. Anger, in particular, points out problems. It reveals things that are wrong. Some of those things are inside of us and require adjustments to expectations or demands. Other problems are outside of us and need to be addressed in a constructive way. Helping step-children understand that anger is good for identifying problems – but not good for solving the – is the first step toward a healthy anger management plan. 3. Be proactive in teaching step-children about frustration-management, anger-control, rage-reduction and releasing bitterness. Model, discuss, read and teach your step-children about anger. There are several good books on this subject available, which are written for step-children at various age levels. 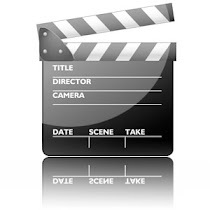 Talk about examples of frustration and anger seen in step-children’s videos. Talk about appropriate responses. Work together as a family to identify anger and choose constructive solutions. When anger problems seem out of control or you just don’t know what to do, get help. Sometimes a third party can provide the helpful suggestions and guidelines to motivate your family to deal with anger in a more helpful way. Step-children can begin to develop bitterness and resentment in their lives – and need help to deal with it. Unresolved anger can create problems in relationships later on. Step-children do not grow out of bitterness, they grow into it. Professional help may be needed. 4. Be ready to show affection. Sometimes all that is needed for any angry step-child to regain control is a sudden hug or other impulsive show of affection. Step-children with serious emotional problems, however, may have trouble accepting affection. 5. Build a positive self-image. Encourage step-children to see themselves as valued and valuable individuals. Simplifying the choices makes the decision process easier. Even young step-children can learn to respond constructively to frustration when they know there are three choices. These choices are actually skills to be learned. Step-children often misuse them or overly rely on just one. Take time to teach your step-children these skills and practice them as responses to angry feelings. 8. Deliberately ignore inappropriate behavior that can be tolerated. This doesn’t mean that you should ignore the step-child, just the behavior. The “ignoring” has to be planned and consistent. Even though this behavior may be tolerated, the step-child must recognize that it is inappropriate. 9. Ease tension through humor. Kidding the step-child out of a temper tantrum or outburst offers the step-child an opportunity to “save face.” However, it is important to distinguish between face-saving humor and sarcasm, teasing, or ridicule. 10. Encourage step-children to see their strengths as well as their weaknesses. Help them to see that they can reach their goals. 11. Explain situations. Help the step-child understand the cause of a stressed situation. We often fail to realize how easily young step-children can begin to react properly once they understand the cause of their frustration. 12. Identify the early warning signs of anger (e.g., clenched teeth; increased intensity of speech or behavior; noises with the mouth like growls or deep breathing; pouting; restlessness, withdrawal, unresponsiveness, or being easily provoked; squinting, rolling the eyes, or other facial expressions; tensed body; unkind words or the tone of voice changes to whining or yelling, etc.). Step-children often don’t recognize anger. In fact, many times they act out before they realize what happened. Identifying early warning signs helps step-children become more aware of their feelings, which in turn gives them more opportunity to control their responses to these feelings. Learn to recognize the cues that your step-child is beginning to get frustrated. Look for signs that come before the eruption. Once you know the cues, begin to point them out to your step-child. Make observations and teach your step-child to recognize those signs. Eventually step-children will be able to see their own frustration and anger and choose appropriate responses before it’s too late. They’ll be able to move from the emotion to the right actions, but first they must be able to recognize the cues that anger is intensifying. 13. Manipulate the surroundings. Aggressive behavior can be encouraged by placing step-children in tough, tempting situations. We should try to plan the surroundings so that certain things are less apt to happen. Stop a “problem” activity and substitute, temporarily, a more desirable one. Sometimes rules and regulations, as well as physical space, may be too confining. 14. Model appropriate behavior. Step-parents should be aware of the powerful influence of their actions on a step-child’s behavior. 15. Never try to reason with a step-child who is enraged. Sometimes step-children become enraged. The primary way to tell when step-children are enraged is that they can no longer think rationally – and their anger is now controlling them. Unfortunately, many step-parents try to talk their step-children out of anger, often leading to more intensity. The step-child who is enraged has lost control. Anger is one of those emotions that can grab you before you know what’s happening. The intensity can build from frustration to anger to rage before anyone realizes it. Whether it’s the 3-year-old temper tantrum or the 15-year-old ranting and raving – don’t get sucked into dialog. It only escalates the problem. Talking about it is important, but be sure to wait until after the step-child has settled down. 16. Provide physical outlets and other alternatives. It is important for step-children to have opportunities for physical exercise and movement, both at home and at school. 17. Say “NO!” Limits should be clearly explained and enforced. Step-children should be free to function within those limits. 19. Teach your step-child to take a break from the difficult situation and to get alone for a few minutes. One of the healthiest responses to anger at any of its stages is to step back. During that time the step-child can rethink the situation, calm down and determine what to do next. Frustrations can easily build, rage can be destructive, and bitterness is always damaging to the one who is angry. Stepping back can help the step-child stop the progression and determine to respond differently. The size of the break is determined by the intensity of the emotion. A step-child who is simply frustrated may just take a deep breath. The step-child who is enraged probably needs to leave the room and settle down. 20. Tell the step-child that you accept his or her angry feelings, but offer other suggestions for expressing them. Teach step-children to put their angry feelings into words, rather than fists. 22. Use physical restraint. Occasionally a step-child may lose control so completely that he has to be physically restrained or removed from the scene to prevent him from hurting himself or others. This may also “save face” for the step-child. Physical restraint or removal from the scene should not be viewed by the step-child as discipline, but as a means of saying, “You can’t do that.” In such situations, a grown-up cannot afford to lose his or her temper and unfriendly remarks by other step-children should not be tolerated. 23. Use promises and rewards. Promises of future pleasure can be used both to start and to stop behavior. This approach should not be compared with bribery. We must know what the step-child likes, what brings him pleasure, and we must deliver on our promises. 24. Use discipline cautiously. There is a fine line between discipline that is hostile toward a step-child and discipline that is educational. DO NOT use physical discipline. Use time-out instead. 25. When emotions get out of control, take a break from the dialog. Sometimes step-parents and step-children are having a discussion about something and tempers flare. Mean words often push buttons which motivate more mean words and anger escalates. Stop the process, take a break and resume the dialog after people have settled down. Most moms and dads are challenged with getting their kids to clean up their bedrooms. One way to shift this struggle is to realize that it is important to the mother or father BUT NOT to the youngster to have a clean bedroom. When you are willing to change the experience of cleaning from a power-struggle with associated rewards and punishments to a pleasant experience associated with fun, love and connection, children are more likely to cooperate, sensing how good it feels to actually have everything in its place. They then take into their adulthood an inner desire to live in a clean, organized environment rather than associating “cleaning” with a dreaded chore to avoid at all costs. 1. Advance your youngster's privileges as he takes more responsibility for keeping his bedroom clean. Let your youngster know that if he keeps his room clean, it'll show he's mature enough to handle more privileges. 2. Avoid making negative statements like, “You’re such a slob” …or… “Your room looks like a pigsty.” Use an upbeat, positive tone of voice and tell him how pleased you were with the job he did last time he cleaned his room. 3. Cleaning a bedroom can be a lonely task, and for the social youngster, it may feel like a torture instead of a way to help the family. Thus, put together “cleaning team.” Working together will make the jobs go faster. Your youngster helps you clean your areas of responsibility, and then you help him clean his bedroom. 4. Every one of your youngster's toys should have a well defined space. Take the time to show her where each item goes, then have her repeat back to you what you've told her. This will make it much easier for your youngster to do her job on a daily basis. 5. Give your youngster regular feedback on how he's performing. Let her know on a regular basis that she's doing a good job cleaning her room. If not, let her know how she could be doing better. Make sure she knows the proper steps it takes to complete the jobs you've asked her to do. If not, show her again. 6. Involve the whole family in the cleaning process, and play some upbeat music while the family cleans to make it a special occasion. 7. Keep your expectations very low. Few children have clean bedrooms. They like them dirty because it's the only place where they have control over their environment. For some children, a dirty bedroom is a badge of honor. 8. Lead by example. Keep the rest of your house as clean as possible to set an example for your youngster. 9. Plan a special activity for the family to celebrate a successful day of cleaning. It's not really bribery—it's just good politics! 10. Set up a reward system. Some moms and dads give their youngster a weekly allowance for cleaning her room. This is an excellent way to teach your youngster how to manage money. You may want to consider giving a daily allowance rather than a weekly one. The immediate reward is often more motivating than a delayed one. As soon as the work is complete, give your youngster his daily allowance – and you'll have a very eager little room cleaner on your hands. To a youngster, a week can seem like an eternity. He's more likely to lose his motivation before he gets paid. 11. 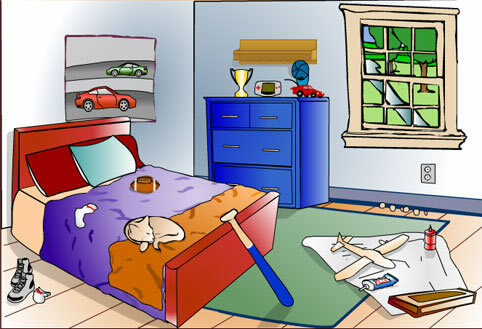 Teach your youngster how to clean his bedroom by incorporating him into your own cleaning. 12. To bring some clarity to the cleaning process, have your child separate the job into straightening and cleaning. Straighten first – then clean. 13. Turn cleaning into a game. Challenge your youngster to see how quickly the two of you can clean his room. Let him know the sooner his room is clean, the sooner he can go outside and play. Challenge him to see if he can do it in 10 minutes or less. Set the timer, turn on the music, and start cleaning! 14. When you make a chore list for your youngster, always take his age and development into consideration. A 4-year-old can get the books back on the shelf and the clothes in the hamper, but he may not be able to make his bed to your specifications. A 7-year-old can do his own laundry with some supervision. Remember, your expectations will change as your youngster matures. Clean the floor. Sweep, or move furniture aside and vacuum. Don't forget to vacuum the dust from under the bed. Clear the desk. Organize the desk so that homework and books are accessible. Throw away old clutter and scrap paper. Empty the wastepaper basket. Put the (now full) trash bag in the trash can or dumpster. Clear the garbage and clutter. Return all dirty dishes to the kitchen, and wash them. Remove cobwebs from the ceiling and corners with a broom covered with your dust rag or the vacuum cleaner. Scrub the bad spots off walls with spray and a rag. Make sure all posters are still securely attached. Straighten and dust surfaces (dresser, bedside table, vanity, shelves, and so on). You do this surface by surface—clear the surface of objects, dust, and return objects neatly. Put away all books, DVDs, CDs, computer programs. Library books go in a pile near the door ready to be returned. DVDs, CDs, and so on, all need to be in their proper boxes, and then put away. Put away the toys and the fragments of toys. Strip the bed and put the sheets and pillowcases in the hamper. Remake the bed with clean sheets. Tackle the clothes. Fold the clean ones or put them on hangers, and put them away in an organized fashion. Put the dirty clothes in the hamper. Put all shoes in the closet in an organized fashion. With a bit of positive reinforcement and creativity, you can motivate your youngster to keep his bedroom clean. Now, if only you can motivate your husband! But that's material for a completely different blog post. Nobody wants to raise a spoiled youngster. But striking a balance between nurturing and over-protection can be hard. Just how much is too much? There are no scientific facts about spoiled kids, no hard facts detailing the subject. However, there are plenty of moms and dads who worry about being over-protective toward their children, and plenty of professionals who have opinions on the matter. A good definition of a spoiled youngster is “one with a sense of entitlement” (e.g., “I deserve whatever I want – and I shouldn’t have to work for it”). This is a youngster who is more interested in herself than in others. Moms and dads who are over-protective and all-giving contribute to this sense of entitlement. What does "over-protective" parenting have to do with having a spoiled child? Over-protective parents don't want their youngster to fail, so they do everything in their power to make sure this doesn't happen. But at a certain point, these moms and dads are no longer doing their youngster a favor. The youngster becomes accustomed to having things done FOR him and assumes that everyone will work for his success (and unfortunately, this is simply not the case). Whenever parents get between their child and life experiences (in order to minimize the consequences of his choices), they are officially being over-protective. 2. DOING TOO MUCH: Doing things for children that they could do for themselves. 4. HOVERING: Doing their laundry, waking them up in the morning, making their lunches, driving them to the park when they could walk or ride a bike, excusing them from helping the family because they have homework. 5. LYING FOR THEM: Writing excuses to the teacher (e.g., “Okay, I’ll write a note to the teacher that you were sick this morning, but you’ll need to be sure and catch up”), or refusing to tell your spouse about a particular behavior problem (e.g., “You better be glad I’m not telling your father about this!”). 6. RESCUING: Buying new things to replace what a youngster loses, staying up late to help with (or do) last minute homework, defending your child when his teacher reports misconduct. So how can parents avoid being over-protective, but still make sure their child is safe? 6. FOLLOW THROUGH WITH KINDNESS AND FIRMNESS. "I can see you are stressed about waiting until that last minute. I’m sure you’ll figure it out. I’m available to help with homework between 6:00 and 7:00 PM on Wednesdays and Fridays." 17. STAND FIRM: Of course, this single act is not going to magically change your youngster. You must consistently tell your youngster when you think he or she is acting spoiled. Explain why you think this and why it's important to compromise or share. Most importantly, begin setting limits and standing by them. 18. TEACH CHARITY: For example, if you believe you've bought too many toys for your youngster, tell her so. Go on to explain that she does not play with all of them and is no longer putting them away or taking care of them. Allow her to choose a few favorite items and then give the rest away to charity. This will teach her about giving to others while learning to value what she has. 19. THINK OF THE FUTURE: Remember that this change won't be easy, but it is important. If you continue to spoil your kids, they will get to the point where they are not satisfied with anything. They will never feel gratified. When you decide to stop spoiling your youngster, it doesn't mean you can no longer buy her designer clothes or nice things - just cut back. Buy one pair of designer jeans, not 5. 20. BE PATIENT. If your child has been over-protected most of her life, she is not going to develop self-reliance over night. So understand that this is a process that will take some time.